When in Bali's Kintamani highland, take the roads less traveled, for this will let you see more than just the beauty of mountains and lakes. One of these narrower roads will lead you to Sukawana village, where you could meet with another kind of beauty -- native Kintamani dogs. A Kintamani dog statue standing on top of a towering Balinese-style concrete monument located in the middle of an intersection, which serves as the village gate, lets passersby know that the village is the place of origin of Bali's, or even Indonesia's, only official dog breed. Looking something like a mix between a Siberian Samoyed and Alaskan Malamute, Kintamanis have long hair, a broad face, a flat forehead, and flat cheeks like Chinese dogs such as the Chow Chow. They can be found as pets in almost every home in Sukawana. Some dig holes to nest their young while others live in small caves in boulders around the area, which is located between 1,000 to 1,500 meters above sea level. On a recent visit to Sukawana, a 2-and-a-half-year-old female Kintamani named Gina was playing in the front yard of the house of her owner, Ketut Ginastra, a 42-year-old vegetable farmer. When she barked for food, Ginastra eventually came with his hand held high above Gina, making her stand on her hind legs in order to reach the food. 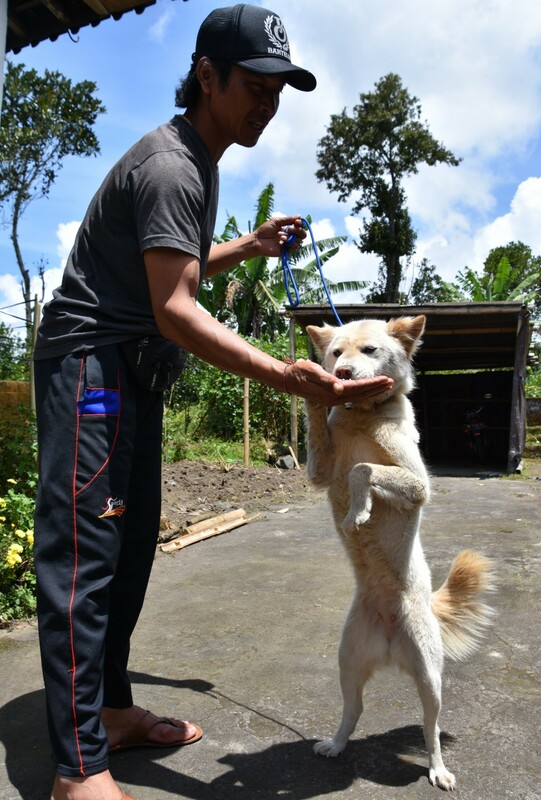 With erect ears, forwardly curved tail, thick white coat, almond-shaped brown eyes, a height of about 50 centimeters, and great agility, Gina has become a favorite in various Kintamani dog shows. Ginastra also has another Kintamani, a 2-and-a-half-year-old male called Mili. The two are his only Kintamanis left after local authorities put down another three during an anti-rabies campaign in Bali in 2016. "Unlike Gina and Mili, I let the other three roam free. The authorities considered them to be stray dogs and killed them to curb the transmission of rabies," he said. Gina and Mili are just two of hundreds of Kintamanis kept as pets in Sukawana, while all over Bali the total number could reach an estimated half million dogs. Despite gaining recognition by the Japan-based Asian Kennel Union in 2012, Kintamanis have struggled to be named as a recognized breed at the global level by the Brussels-based Federation Cynologique Internationale. "We have been dreaming to see Kintamani dogs get global recognition since 1995," said Putu Ricang, chairman of the Bali Kintamani Breed Union and also chairman of the Bali chapter of the All Indonesia Kennel Club. "We hope this dream will come true within this year or next," Ricang said, adding that financial issues and another issue related to a purification effort have slowed down the process to gain recognition. Bangli Regency has passed a local law to designate Sukawana and two other neighboring villages in Kintamani district as Kintamani dog purification areas to prevent cross-breeding from occurring, as many villagers still let their dogs roam free. To support the purification effort, which is aimed at producing a significant population of standard Kintamani dogs, local breeders have also taken the initiative to build a Kintamani-only breeding center. Local parliamentarian and businessman Nengah Darsana, 38, runs a breeding center which currently has seven adult females and one adult male, named Zimba. All have white coats, the most preferred color hair of the Kintamani. The three other colors of black, fawn and brindle are less popular. Zimba, 5-years-old, was found when he was a young puppy in Sukawana. "The owner did not want to sell him, although I already offered him a new TV set and a refrigerator. But finally the owner gave up after I offered him 5 million rupiah (about $360), which was a huge amount of money at that time," said Darsana. The award-winning Zimba, having a luxurious double coat, especially on his neck and shoulders, has fathered many puppies sold between 1 million to 5 million rupiah each. Darsana said that the center, called Surya Kennel, which currently can accommodate a total of 22 dogs at one time, only breeds standard Kintamanis similar to Zimba, a medium-sized dog which is quick and light on its feet, moves freely and gracefully, and looks effortless when running and playing. "One day I want to expand this breeding center so that it can accommodate about 50 dogs. This way, I could contribute to the process to make Kintamanis globally recognized," Darsana said. When the native Bali breed finally gains recognition someday, he proudly said, "I want to give Kintamanis to any Japanese prime minister or other world leaders visiting Bali."